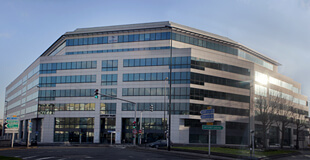 FIME's corporate management team and support services are based at its head office in Antony, south of Paris, France. This team is supported by the sales force and administration personnel that focuses on targeting the European, Middle East and African (EMEA) regions. Our building is located in Antony at the Place Charles de Gaulle roundabout. The FIME Head Office is located on the 4th floor. Take RER B, direction Antony/Saint-Rémy-lès-Chevreuse and exit at the station "La Croix de Berny"
When you exit the RER train station, go left, down the rue Velpeau, then right to the Avenue Charles de Gaulle until you reach the roundabout with the fountain.